Conflict of Interest (COI) training must be completed by individuals who receive funding from a Public Health Service (PHS) awarding agency. Currently, UNL is using the Collaborative Institutional Training Initiative (CITI) website to meet this regulatory requirement. Conflict of Interest training must be completed at least every four years and before grant funding will be released by the UNL Office of Sponsored Programs. To ensure ease of CITI training registration, first identify whether you are a new user or you are already a registered user. The process of selecting your course will be different based on your current status. Upon navigating to the website, please be aware that UNL does not subscribe to the use of Single Sign On (SSO). Usernames and passwords are chosen by the user. Create your user account through the CITI website (www.citiprogram.org). This training does NOT require payment from the trainee/user if you are completing this training for UNL purposes only. In other words, we do not require CME/CEU credits or registration as an Independent Learner. If this is selected as an option, this is the responsibility of the user to pay for any fees assessed. The email address you enter does not have to be your UNL email address but it should be one that is used frequently so that you do not miss important reminders to refresh your training. Most UNL users will enter their email associated with their Blackboard/Canvas account. Page 6 of the registration form will ask you to provide your institutional email address. Please feel free to use the same email address as before. Select the “Conflict of Interest (COI)” course on page 7 of the registration process. More than one selection can be made when signing up through the new user registration process. If you have selected more than one course and it pertains to human subjects protections or Responsible Conduct of Research (RCR), please refer to the human subjects training instructions or RCR training instructions page for further guidance. Login to your user account through the CITI website (www.citiprogram.org). If you have forgotten your username/password, you can retrieve this through the CITI website. STARTED YOUR CITI ACCOUNT WITH UNL: If you no longer use any emails that are currently registered with your account AND you were originally affiliated with UNL, please contact Research Compliance Services. RCS staff have administrative access and would be able to add a new email address that will allow you to maintain the current account with all past reports. STARTED YOUR CITI ACCOUNT AT A DIFFERENT INSTITUTION: CITI allows retrieval of account information via their website; however, if you no longer use any emails that are currently registered with your account AND you did not originally affiliate with UNL you should contact CITI to regain access to your previous account. If you can access your previous account, you may receive credit at UNL for any previously completed human subjects training but will not receive previous credit for any COI or RCR training. Start by ensuring you have selected the “University of Nebraska – Lincoln Courses” on the Main Menu if you are perhaps affiliated with multiple institutions. 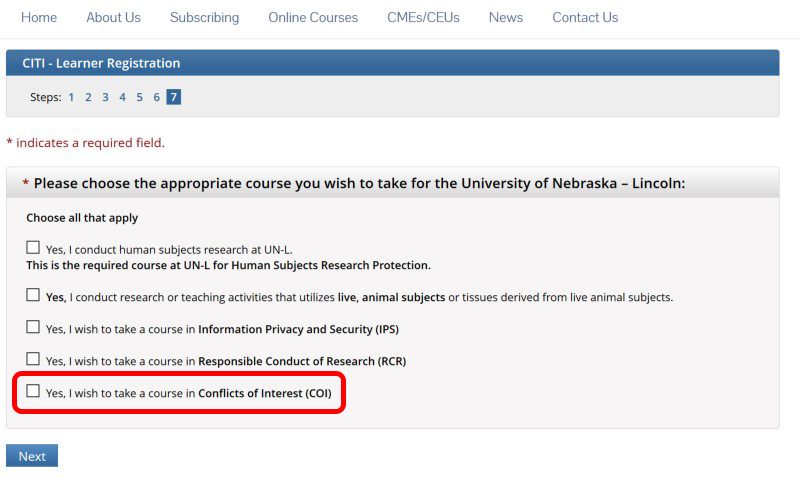 Once on the next screen, please scroll down to the bottom of the page and select the Conflict of Interest course. You must complete the Integrity Assurance Statement to begin the course by clicking on the actual title of the statement. All required modules must be completed in order to receive credit for the training course. After you have completed the training, you are encouraged save a copy of your completion report for your own records. NUgrant and CITI are two separate programs and are not electronically linked to one another. Training completed by all users is manually updated via NUgrant by Research Compliance Services staff at least every 48 hours during business days. Your training, if completed at the time of starting a new Interest and Outside Activity Reporting Form (IOARF), should be recorded as up-to-date. The completion report is no longer required to be attached to the IOARF. The Office of Research and Economic Development offers informal in-person training sessions on filling out the IOARF through the NUramp series. Two IOARF training sessions are offered each semester.